Last week saw one of the gayest, most fun and debaucherous celebrations of the year take place in Massachusetts as the 40th anniversary of Provincetown Carnival Week rolled into town. Each year in mid-August, partiers from around the globe gather at the tip of Cape Cod for a week of drinking, drag shows and … well, more drinking. Celebrating such a big anniversary this year only had those in Provincetown partying bigger and better. Now one of the largest LGBTQ celebrations in the United States, Provincetown Carnival actually started out in 1978 when a group of queer P-Town inn-keepers wanted to bring something new to the area. More than just a party week, Carnival is a great showcase of the truly creative legacy the town offers. 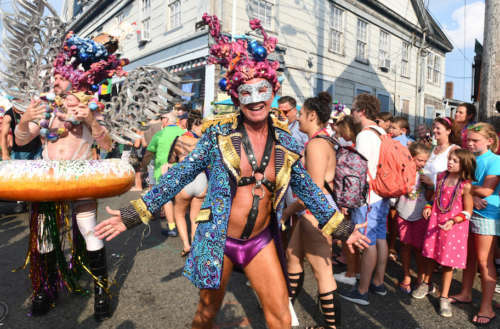 This year’s theme for Provincetown Carnival was “Mardi Gras by the Sea,” and the motif was sprinkled throughout the week’s many dance parties and boat cruises. Among Carnival Week’s official events were the “Nights of Bacchus” opening costume party, Monday’s Rajin Cajun Pool Party, the 30th annual Voodoo Party, the Poseidon underwear party at Purgatory and the “Nights of Adonis” closing masquerade party. The theme was of course hugely present during the highlight of Carnival Week, Thursday’s parade down Commercial Street, for which nearly every local and visitor alike dresses up to join in on the fun. The week also featured a live performance by gay-favorite pop performer Betty Who. In honor of the big 4-0, this year’s Provincetown Carnival parade featured no fewer than 40 grand marshals. Among them were famed queer director John Waters, activist Kate Clinton, drag legend Varla Jean Merman, performer Jimmy James and author Michael Cunningham. Have you ever been to Provincetown Carnival Week?